The dialogue is clunky and lots of what happens is ridiculous, but even still, the movie holds your attention with it’s villainous leads doing terrible things at all times and trying to get away with them. Gang Related is a b movie with lots of problems that still ends up being mindless fun. This is certainly not a great film in any capacity, but watching the two detectives do all kinds of terrible things and constantly get in over their heads, is entertaining. The story is weak and feels very familiar, and the dialogue is at times pretty awful. Still, the movie pulls through. 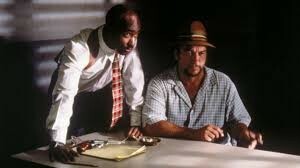 Credit that to the likeable actors, Tupak Shakur and James Belushi. The story does switch gears and go in a new direction just in time, before the film wears out it’s welcome. There might be loads of blunders here, but as mindless entertainment, the movie works. There are a lot of reasons to not like the movie gang related. It’s predictable. The story isn’t really all that unique. The dialogue is awful. The characters do things that don’t make any sense. And yet, despite all of these qualities, the movie still comes out on top. Barely. That’s because there is likeability to these actors and to a movie that features main characters that are terrible people doing terrible things. We are fascinated by how dumb these guys are and how they are constantly digging the hole deeper for themselves. All of that is enough to keep us entertained, despite lots of grimaces and head slapping along the way. 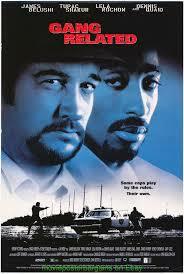 The movie is about two cops who are involved in some very illegal activity. Murder. They murder drug dealers. In fact, they have a whole routine where they pretend to be drug dealers themselves, meet the real dealers, setup a deal, exchange drugs for money, and then follow the dealers away from the meeting spot. They pull up beside the dealers and shoot them, taking both the money and the drugs and continuing on their way. Since these cops are the ones who get called in to investigate the murder the next day, it’s pretty easy for them to write it off as just another “gang related” incident. It’s one less drug dealer off the street, they tell themselves, and that’s how they are able to look themselves in the mirror and keep on going. the two cops are Davinci and Rodriguez. Davinci is played by James Belushi, as the big honcho running the operation. he’s the sleazier of the two detectives, not caring who he kills or who gets hurt along the way. Rodriguez is played by Tupak Shakur. Tupak didn’t have a whole lot of movie roles before he was killed, and that’s unfortunate, because he is a fun actor to watch. even when it seems like he is mostly just whining, like he is in this movie, the actor still has presence. Just look at some of his other movies like juice and Gridlock’d. Here’s a guy that rarely tried to be something that he wasn’t, who played in movies which always dealt with life on the street. Here, in gang related, playing a cop is possibly his biggest stretch. Tupak’s character, Rodriguez, is the member of the team who actually has a conscious. He’s the guy that constantly has to keep his partner in check, or at least tries to, saying things like, “we can’t just go around killing everybody.” when his partner tells him, “we have to find the killers,” Rodriguez responds back with, “we are the killers.” not the best dialogue here. At least it’s better than what the movie started out with. A conversation between the two partners about how Davinci is thinking about Hawaii because he’s not in Hawaii, but if he were there, then he wouldn’t be thinking about it anymore. This is some of the worst dialogue I have ever heard. It’s characters talking just to talk, without having anything real to say. And it’s the opening conversation of the movie. Not exactly confidence-inspiring for how the rest of the film will turn out. The day after the drug dealer murder, the two partners go out to the crime scene to start working the case. When they get back to the police station, their boss calls them into his office. There’s a man from the FBI in there with him and they inform the two detectives that the man who was killed was actually an undercover agent, working a case about corrupt cops. This is the first of many holes that the boys have dug themselves into. It also leads to the first of many mistakes the movie makes. If the FBI knows that this agent is working a case about corrupt cops, why isn’t there a list of corrupt cops who are potential suspects? The attention gets turned pretty quickly to a homeless man, once our two detectives decide to use him as their prime suspect. But first, there are a few mistakes they make. Like the scene where they drive off to the middle of a deserted overpass before talking with each other. The car speeds out there and comes to a screeching halt and both men jump out of the car. They now begin to shout at each other and push each other around. The idea is that they weren’t talking in the car, in case it is bugged, but instead waited until they got to a deserted spot to talk. But now they are shouting and pushing right out in the open, where anyone who was following him or her could see the whole thing. Wouldn’t talking in the car have been better? Or maybe at one of their homes. For a movie that is pretending it’s detectives are being careful about where they speak, it certainly gives that idea up pretty quickly in some of the next few scenes where Cynthia, a local stripper who is been helping them out, is called in to look at a police lineup. Davinci has found the perfect guy to take the fall for all of this. He’s a man named Joe, a homeless man who lives in the alley behind Cynthia’s building. The detectives need to convince her to identify him, and that’s a bit of a struggle. They end up having loud conversations and arguments about it right there in the middle of the police precinct hallways. It’s the worst place to be having these conversations and that’s exactly where they’re doing it. The first half of the movie is about putting the blame on Joe. The detectives bring in multiple suspects and try to frame each one of them in the exact same way. While this is played for humor, seeing how many ways they can go wrong, on an intelligence level, it’s pretty weak. The detectives should have learned a little each time and changed up their questioning from one suspect to the next. Instead they continue to make blunders even after they start to pin it on Joe. They steal a gun which was used in another murder case that is still going to trial, and it turns out that gun is needed in order to convict the other murderer. The second halves of the movie become something slightly different, and thank goodness for that. At least the story goes in a new direction, with James earl Jones being brought in as the family lawyer of Joe, who apparently is not what we or the detectives thought. Now there are new complications in the case, including a witness testimony that is considered perjury and a bail bondsman who gets more than he signed up for. Gang Related is not a very smart movie. At best, it’s a guilty pleasure b movie that you can enjoy without having to think very much about. Despite a number of flaws, the movie is still somewhat entertaining. I like the way that one problem for these detectives spirals into another. It also helps that the second half of the film goes in a new direction. The movie is nothing special, but it still manages to be a semi-worthwhile bit of mindless fun.